Seb Morris and Bentley Continental GT3 team-mate Rick Parfitt Jnr returned to winning ways during the penultimate round of the British GT Championship at Brands Hatch Grand Prix Circuit on Sunday, 6th August, to crucially leap to the top of the title standings ahead of next month’s season finale. Delivering a dominant victory during the two-hour race, battling through superbly from fifth on the grid, the Team Parker Racing duo departed the Kent track with a 10.5 point advantage at the top of the GT3 title race – having arrived at Brands Hatch 12 points adrift. While rain-affected qualifying on Saturday, 5th August, didn’t work in the pairing’s favour with the wet conditions not suiting the monstrous No.31 Bentley, in the dry on Sunday they were able to use the car’s strengths to full effect. 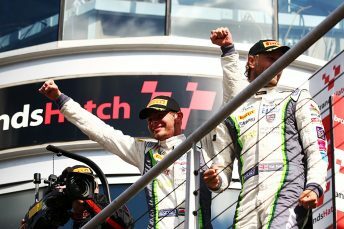 Parfitt Jnr took the opening stint and carved his way through into the lead of the race by the end of the first hour and Morris then built on his team-mate’s work to ease to the chequered flag well over half a minute clear to seal a magnificent win, their third of the year. “I’m absolutely elated with the result, I didn’t expect it whatsoever”, said the Marford-based BRDC Superstar and MSA Team UK racer, “Rick drove an absolute blinder in his stint, he did a fantastic job to get to the front, and then it was all about bringing it home. The car was awesome, the Team Parker guys were spot on as always, and I was able to increase the lead late on which was great. Morris started off the penultimate weekend of the season strongly with the fastest time in opening practice, with Parfitt Jnr then lapping sixth fastest in session two. Rain arrived ahead of qualifying and during the ‘Am’ session, Parfitt Jnr was sixth quickest once again. During the subsequent ‘Pro’ run, Morris was also sixth to, unsurprisingly, secure a third row start on combined times. As a result of a penalty for one of the rival entries, though, the No.31 Bentley began round nine from the head of row three in fifth place. Although edged back to sixth initially, Parfitt Jnr moved back into fifth on lap two and after pressuring the Lamborghini of Liam Griffin for several laps he made the breakthrough to take fourth on lap 10 with a great pass on the brakes into Paddock Hill Bend. Swiftly moving into the top three, Parfitt Jnr then closed on the then championship leading Lamborghini of Jon Minshaw. On lap 15 Minshaw went slightly wide at Druids and the Bentley got alongside, but that meant it was the outside line for Graham Hill Bend. Switching back to get the inside for the run to Surtees, Parfitt Jnr sealed a great move to take second from his chief rival. Closing down the race leading Aston Martin, as the race approached the end of the first half hour the Safety Car was required and so the pack bunched up. At the re-start, Parfitt Jnr wasn’t in a position to challenge James Littlejohn for the lead but as the opening hour came to a conclusion the Aston slowed and Parfitt Jnr swept past. Holding a 20 second cushion when he pitted to hand over to Morris at the end of lap 39, when the Welshman entered the race he had a lead of around 25 seconds and went on to control the action from the front with a faultless drive. Initially stabilising the advantage and making sure he didn’t make any mistakes through traffic on the highly congested circuit, Morris began to put more distance between himself and the pursuers during the final half hour to eventually win by a huge 33.8 second margin. In terms of outright pace, Morris just missed the fastest lap of the race by a mere 0.2 seconds. There is now a lengthy seven week break from British GT action ahead of the grand finale of the 2017 season, round 10 at Donington Park Grand Prix Circuit in Leicestershire, over the weekend 23rd/24th September.